Line Striping By Moore Seal Inc. 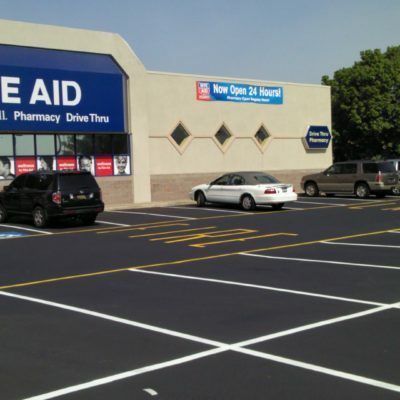 Properly line striping a commercial parking lot is extremely important. The more clearly striped a parking lot is, the safer it becomes. Bright yellow speed bumps notify drivers that they must slow down. Clearly defined crosswalks give pedestrians a safe passage across busy lanes of traffic. Loading zone signs notify drivers and pedestrians of constant stop-and-go traffic. Bright white “stop bars” give a defined place for vehicles to stop. A freshly painted parking lot that is properly line striped is a safer place. By law, asphalt parking lots must have some required markings, including a fire lane and ADA compliance with proper line striping. Fire lane standards are set by the state fire marshal. In Delaware for instance, it will consist of a yellow curb with 4” fire lane lines and fire lane signs distinguishing the fire lane/no parking zone. ADA compliance is also clear with the proper line striping. The number of parking spaces on the lot dictates how many handicap stalls you must have. The law is also specific about how the spaces are to be line striped. 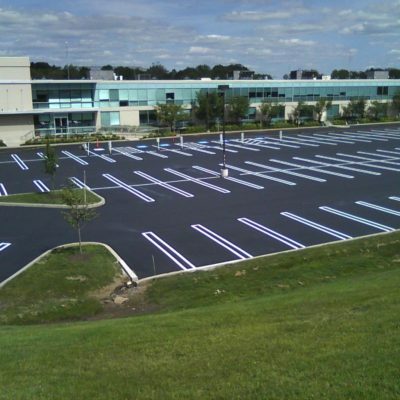 Call Moore Seal Inc. today for all of your parking lot line striping needs. Directional arrows and stop bars can assist you in influencing the traffic patterns and easing congestion. Direction is essential in not only parking lots but at airports as well.